811 was part of the second batch of Leyland Leopard DP’s (Dual Purpose Vehicles) delivered to Ribble in the mid-1960’s, which were to the BET style of bodywork. The ten vehicles in the batch 808-817 were the only Ribble DP’s built by Weymann. The previous ten delivered in 1964 were bodied by Marshall, as were the subsequent 1966 and 1967 deliveries. 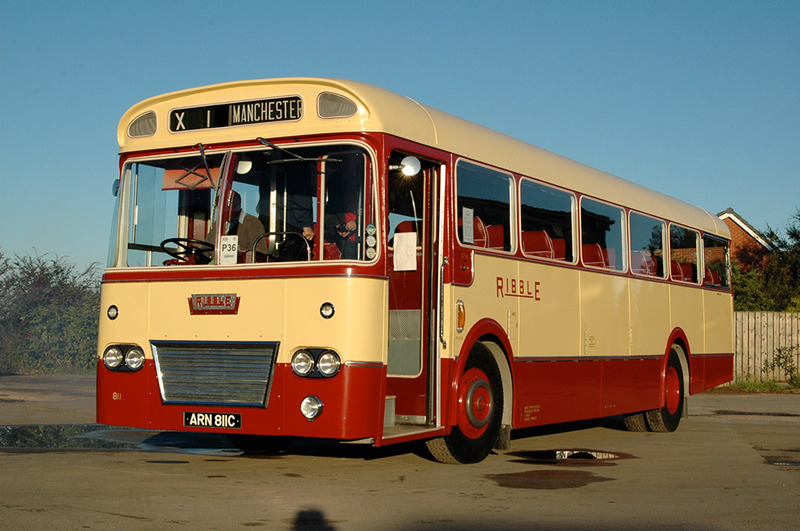 The Dual Purpose configuration suited Ribble’s operational requirements well in the 1960’s, as this type of vehicle could be used on medium distance express services, but could also be used on stage carriage duties as required. 811 was delivered to Kendal depot in 1965, and worked from there until 1968 when it moved to Keswick. Also in 1968 it was converted to OMO configuration, as were all the DP’s during the 1968-69 period. Despite this, it remained mainly on express routes which were usually crew operated until the mid-1970’s. In July 1969 811 moved from Keswick to Ambleside, where it remained until withdrawal at the end of 1977. In August 1978 it was acquired by Sykes (dealer). In March 1979 it was bought by C&F Coaches, Fleetwood and used on a local service in the Knott End area. Withdrawn by C&F circa 1991, it was acquired by a local preservationist who kept it until 1999. It was then acquired for the RVPT collection. Restoration began in 1999, but proved to be a protracted affair. Years of outside storage had taken their toll, and the framework was in very poor condition and had to be largely replaced. Its rebuild was further complicated by a twisted chassis (presumably the result of accident damage? ), and this had to be corrected before rebuild. Restoration was finally completed in 2006, and since then 811 has been one of the front line vehicles in the RVPT collection.